Join the growing number of teachers who have discovered why storage containers are perfect for storing furniture and school equipment securely onsite at educational premises. Storage Containers for schools allows you to store extra tables, chairs for exams, playground toys, PE equipment, mowers & more in secure steel containers. The outbuildings have been broken into again? You need to free up more indoor space? You’re fed up of the muddy equipment being trailed all the way back into the building? You need extra lockable storage space but the budget is groaning? Sporting equipment, gym and athletics items are too bulky to be stored indoors? Our secure Steel Containers solve all these problems. 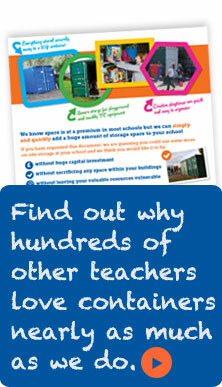 See a case study for our containers supplied to QEH School in Bristol. The Queen Elizabeth Hospital School now have 3 containers on their grounds to keep sports equipment and gardening machinery safe and dry. Don’t worry that you might get an awful looking container that has been around the building sites, we only send top quality containers to schools because we know how important it is to keep your site looking good.